One of the most important, but oft-neglected aspects of body fitness is eye health. The eyes are windows to a person’s soul. If this is true, then it is absolutely important to take look into its health and fitness from time to time. Invariably, after a certain age, a person’ eyes undergo negative changes. This can be delayed or prevented, depending on the case and the issue on hand. While people may take some time out and exercise, there are not many people who spend time exercising the muscles in the eyes. Several experts recommend Yoga for eyes, in order to prevent eye problems. Yoga for eye health includes various exercises and techniques to improve overall eye health. Yoga for eyesight consists of mainly those exercises that relax the mind and keep it devoid of any thought, just like in the case of meditation. In fact, the people who practice yoga regularly often claim that after meditation the eyes feel much more relaxed. Yoga exercises eyes and they are connected to the brain via the optic nerves. This also regulates the nerve impulses in the muscles of the eyes. Therefore, yoga for eyes exercises not just reduce the tension in the eyes, but can also help in the reduction of stress throughout the body. According to yoga, a lot of eye problems are due to a loss of muscle tone in the eyes. The loss of elasticity in the eyes reduces the ability to focus at different distances resulting in weaker eyesight. 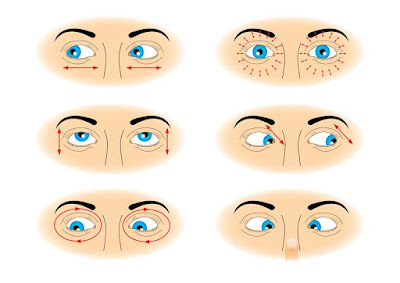 Eye exercises are important as they reduce tension in the eye muscles. Up and down: Raise your eyes and find a small point that you can see clearly without straining, without frowning, without becoming tense and, of course, without moving your head. While doing this exercise look at this point each time you raise your eyes. Next, lower your eyes to find a small point on the floor which you can see clearly when glancing down. Look at it each time you lower your eyes. Breathing should be normal. Move your eyes upwards as far as you can, and then downwards as far as you can. Repeat four more times. Blink quickly a few times 1 to relax the eye muscles. Right and left: Now do the same using points to your right and to your left, at eye level. Keep your raised fingers or two pencils on each side as guides and adjust them so that you can see them clearly when moving the eyes to the right and to the left, but without straining. Keeping the fingers at eye level, and moving only the eyes, look to the right at your chosen point, then to the left. Repeat four times. Blink several times, then close your eyes and rest. Contraction: Close your eyes as tightly as you possibly can. Really squeeze the eyes, so the eye muscles contract. Hold this contraction for three seconds, and then let go quickly. Tip: This exercise causes a deep relaxation of the eye muscles, and is especially beneficial after the slight strain caused by the eye exercises. Blink the eyes a few times. Palming: Use your hands so that your palms cup your eyes. This technique to improve and strengthen vision is called palming. You don’t need to put any pressure on. Make it so that your eyes can blink if you want them to. Rub your hands together before you do this to help generate some energy and just let your hands warm your eyes. This really helps heal and nourish them, and takes out any tension in your eyes.